Being that we are a family of boys, we are very big into anything boyish possible! Not to mention the fact that I studied Mechanical Engineering for years AND we live in Michigan near pretty much every automotive company in the world, we are very big into cars, trucks, and all things automotive. 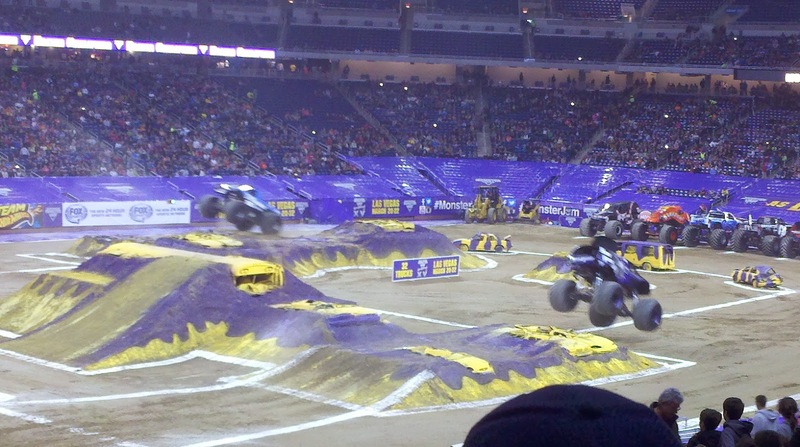 When I was invited to see Monster Jams in Detroit, I knew the boys would be pumped and would jump at the chance to attend this event at the beautiful Ford Field! 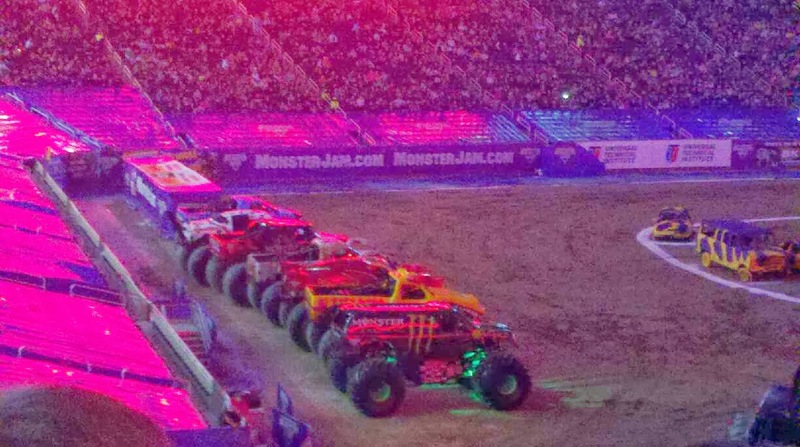 January 11th, 2014, we decided to make it a family event and we all attended the Monster Jam! Now this an event I have never been to nor had any one in my family. We hadn't even considered it something we'd be interested in until it came to Detroit! Reading all about it and watching the TV interviews on the news, both of the boys got more and more pumped to see it! "Monster Jam®, starring the biggest performers on four wheels: Monster Jam monster trucks! The twelve-feet-tall, ten-thousand-pound machines will bring you to your feet, racing and ripping up a custom-designed track full of obstacles to soar over or smash through! Monster Jam provides a massive night’s entertainment tailored perfectly for your family’s budget, and these colorful, larger-than-life beasts are sure to capture the hearts of both young and old." Even more exciting, for the first time in over a decade, Chrysler introduced the brand’s first “MONSTER” to enter the racing series - Mopar Muscle. Unfortunately, we had planned to attend the unveiling which was held at the Pit Party, but we decided to pass. We knew that spending well and over 8 hours at Ford Field was just not realistic for most kiddos. 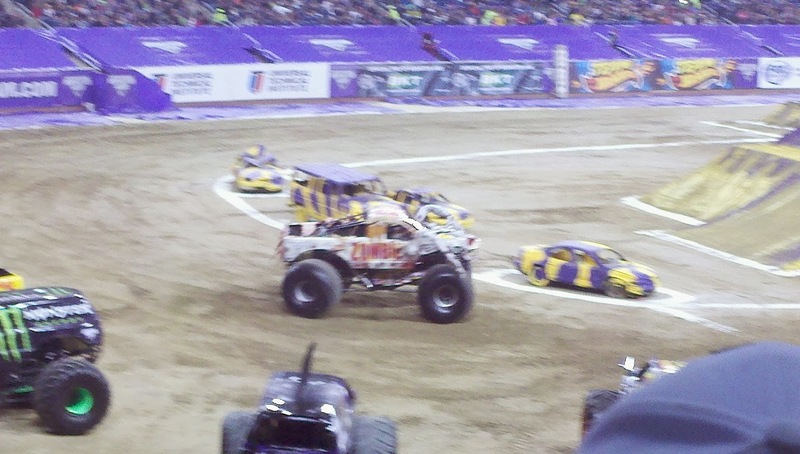 However, if you are an auto lover and adult monster truck fan, this was a great separate event to attend. At the Pit Parties you are able to meet the drivers, get autographs, check out the trucks up close, and so much more! Definitely worth the $10 add on when purchased along with your show tickets. One thing I have to suggest from the beginning is to bring a pair of noise cancelling headphones especially if you are bringing little ones! We knew it would be loud but imagined no where near what it was. We just knew that when we took Declan to Disney on Ice, it was even too loud for him there. We brought a set for both kids and were glad we had! If you forget though, I know there are sets available for purchase there! What exciting event to attend! This is one of those shows which keeps you pumped and interested the whole time! No matter how many times they repeated their laps and stunt runs, there is always a chance for something to change or go wrong. It was also quite exciting to see each of the women drivers make their rounds! It was truly hard to say which truck was our favorite. The boys loved Iron Man and Zombie but each round we cheered for a different driver! 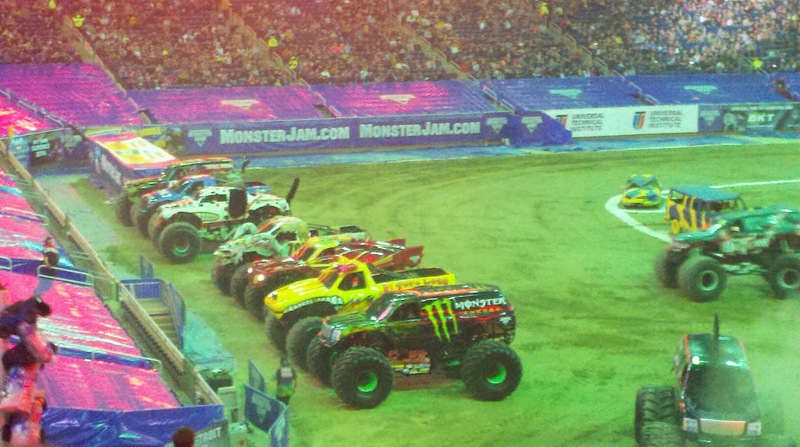 The Monster Energy truck seemed to be a crowd favorite and of course Iron Man was the winner which everyone loved! The entire drive home both boys surprisingly couldn't fall asleep as they were psyched talking about each of the trucks and how they wanted to be Monster Truck Drivers when they got older! Parking - Varied depending on lot you chose and how close to the venue you are. Recommendation: I thought this was awesome and so did everyone in my family as well as those I know who attended! I would recommend attending this if it tours in your city no matter who you are! This was worth the money and more if you ask me!